The Archaeologists have had a break from site this past week with no items of interest discovered in our excavations. The excavation and base for the pavement at the South end of Durham Street outside Smiths Motorcycles, Gengy’s and Eastern HiFi has been progressing well this week. Work will continue in this area next week. We want to remind everyone that the businesses in the area are still open. From food to furniture, to your various transportation needs and more, it’s all right here on Durham Street. There is just one concrete slab left to pour in the intersection next week. 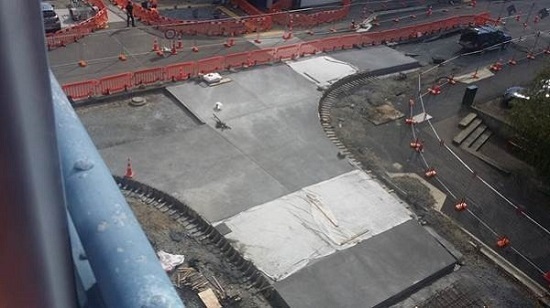 The curved concrete nib between the new roadway and footpath will then be boxed and poured. The concrete will need a month to completely cure before traffic can use this area. The laying of paving stones outside Work & Income office is well underway. The remaining pavement work on the west side of the intersection is scheduled to be complete within the next 2 weeks. The final piece of stormwater drainage work on the intersection will be completed next week. The lane from Durham Street to Bongard Centre has re-opened while the work from the University to Cameron Road section is shaped up. 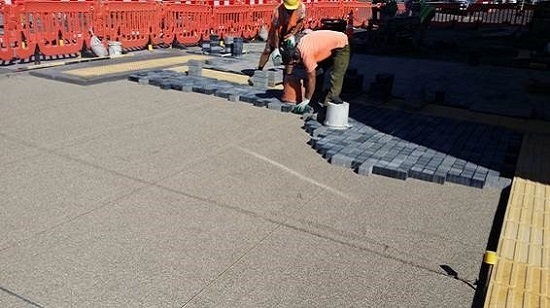 Work on the Lane from University of Waikato to Cameron Road was underway again this week as the nib kerb adjacent to Craigs was laid, and the laneway pavement has been excavated in preparation for new pavement aggregate to be laid and asphalted. Please contact Keith Campbell our Stakeholder Manager if you have any concerns or questions.